The Godalming Film Society, a largely undiscovered gem at the heart of our community, is a not-for-profit voluntary organisation established in 2007 to encourage the enjoyment of film. It is organised by a management committee of about 10 members who also choose the programme each year, taking account of suggestions from the membership. The Society screens films at the Borough Hall on a Tuesday evening at about two weekly intervals throughout the winter season from September to April. We show classic and contemporary films of all genres and from many different countries, but generally do not show films that are on general release or being screened by Godalming Town Council. Many of our selected films have won prestigious awards at film festivals around the world and those not in English carry subtitles. We currently have around 250 members of whom typically at least half will come to each screening. Our season includes 17 full length films and a small number of ‘shorts’, usually lasting not more than 15 minutes. 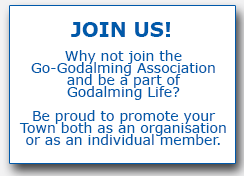 Membership of the Society costs just £30 for a full season and £20 if you join after December, which represents some of the best value entertainment it is possible to find in Godalming. Members are also entitled to bring guests. Apart from the screening of feature films and shorts, we have occasional visits from actors, writers, directors and producers to talk about the films they have been involved with, and the Society has just announced its new Awards Programme, under which we will consider making awards to film projects with local content or benefit. You can find a wealth of information about the Society as well as about every film in every season for nine years.